Every year we put together the Annual Report of Baan Unrak to provide the government with an audited account of all that transpired within that year. Some of it consists of numbers and data and some of it describes the different activities and projects the children are involved in throughout the year. Overall the Annual … Continue reading "2017 Annual Report"
In the heart of Baan Unrak land on the top of the hill we have everything which is most precious to us. It is where we gave farewell to two of our little ones that had to leave before their time. They had arrived with too great of sickness. Our heart is there with them. … Continue reading "A Special Place for a Special Occasion"
Since the children have been off on break we have implemented a work schedule for them in the mornings. This is extremely important for the children to understand hard work, discipline and responsibility. For three hours after breakfast we ask that all the children take the time to engage in tasks that need to be … Continue reading "Summer Break Service Work"
Nine Children went to the Bangpu Nature Education Center which is outside of Bangkok to plant Mangrove trees for a project with Rangsit University. 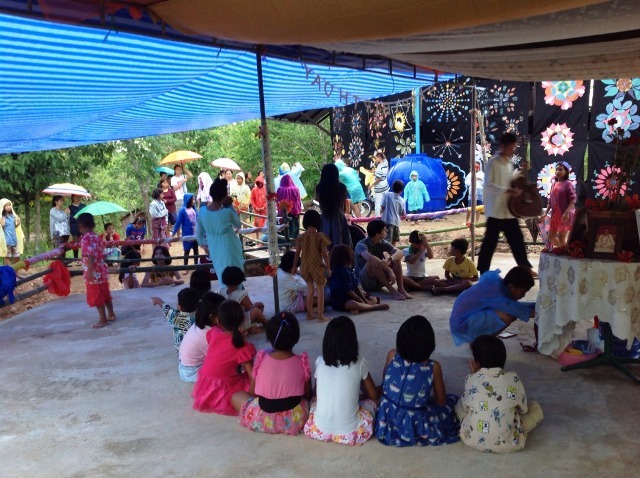 Some children from Baan Unrak children’s home were invited to participate in this project. The project was to restore and replenish the Mangrove Trees along the coastline. These trees are special … Continue reading "Bangpu Nature Education Center"
To see the world through the eyes of a little child is to see a world of possibilities and wonder. In their innocence they believe still in this mystical land of fairies and dragons. This more than ever is true for our little Ishvari that was in need of a mirror to see her reflection … Continue reading "Ishvari’s Magic Cabinet"
Songkran is the most important and loved festival of Thailand. It is so fun AND FULL OF WATER GAMES. It marks the Thai and Burmese New year. Even the most laborious person will stop their work to play water games with friends and neighbors. Baan Unrak is no different. Everybody wants to go out everybody … Continue reading "Sacrifice behind the festival"
It is hard to forgive after having lost the immediate family and being abandoned by the extended family. The little boy that came to Baan Unrak long ago is a man with his own family now. But He could not live his life in peace. There was always something that pulled him down in a … Continue reading "Forgiveness"
It was the most irresistible invitation when our new Baan Unrak’s leaders asked for the bravest ones to go on a jungle excursion. A 4 hour hike led them into the unknown, and away from the accustomed surroundings. It was an exciting but tiresome time. The journey back was riverside, riding inflatable tubes and collecting … Continue reading "Nature’s Immersion"
With every opportunity, Baan Unrak continues to improve relations with our Sangkhlaburi neighbor. The most recent has been a big step in fostering deeper connections with community members. Pripana and Noppap, two of our young children, entered a singing competition originally intended for local adults. Praipana was the singer and Noppap was the guitarist. It was such … Continue reading "Sangklaburi Singing competition"